The issue of the memo has gripped Washington just as the Russia meddling probe edges closer to the White House. Donald Trump was caught on TV cameras telling a Republican "Don't worry, 100 percent"
Washington: President Donald Trump has told a lawmaker he plans to release a secret Republican memo alleging that a politically motivated Department of Justice and the FBI flagrantly abused regulations to spy on his campaign. Republicans are keen to see the four-page memo -- written by Republican lawmaker Devin Nunes, the chairman of the House Intelligence Committee and a close defender of Trump -- released, and his committee voted to do so. 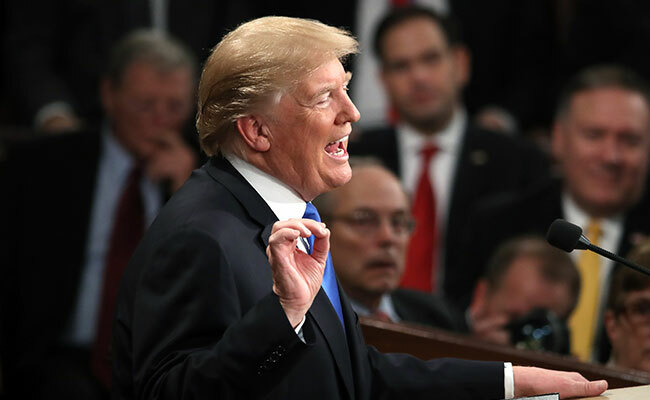 After finishing his State of the Union address Tuesday night, Trump was caught on television cameras telling a Republican lawmaker who urged him to release it, "Don't worry, 100 percent." Democrats say the memo is highly distorted and political, and ultimately aims to discredit special prosecutor Robert Mueller's probe of possible collusion between the Trump campaign and Russia in the 2016 election. According to news reports citing people who have seen the document, it sums up how the Justice Department and FBI were able to obtain a so-called FISA national security warrant to run surveillance on Carter Page, a Trump election campaign advisor with extensive Moscow contacts. "There are legitimate questions about whether American civil liberties were violated by the FISA process," House Majority leader Paul Ryan said Tuesday. "There may have been malfeasance at the FBI by certain individuals." The memo alleges that the department depended on the contentious and unproven "Russia dossier" -- compiled by former British intelligence agent Christopher Steele and financed in part by Democrat Hillary Clinton's presidential campaign -- to justify the warrant to the top-secret FISA court. In addition, the memo alleges that after Trump became president, the warrant was extended by Deputy Attorney General Rod Rosenstein -- the DOJ official who appointed Mueller to lead the Russia probe, and the only person who can fire him. Rosenstein took charge of the probe when Attorney General Jeff Sessions recused himself -- a move Trump has often criticized. The release of the document, based on highly classified information, is strongly opposed by the Justice Department and the Federal Bureau of Investigation. Democrats also say they cannot debunk it without themselves releasing top secret counterintelligence information. The ranking Democrat on the House Intelligence Committee, Adam Schiff, said Monday the committee had "voted to put the president's personal interest, perhaps their own political interests above the national interest, in denying themselves even the ability to hear from the department and the FBI." "That is, I think, a deeply regrettable state of affairs," said Schiff. All Democrats on the committee opposed the memo's release. Release of the memo would come just as Mueller is pressing the White House to let him interview Trump in the Russia investigation. Besides collusion, Mueller is examining whether Trump illegally attempted to obstruct the investigation. Analysts say the memo has two targets. One is the Republican base, which is all too ready to believe that the probe is a politicized operation by a corrupted, anti-Trump Justice Department and FBI. Secondly, it aims to discredit Mueller and to undermine Rosenstein. That, Democrats speculate, would allow Trump to pick a replacement who would then fire Mueller. According to reports in The New York Times, which have been denied by the White House, Trump has privately expressed over the past year the desire to get rid of both Mueller and Rosenstein. The president himself suggested he saw eye-to-eye with Nunes when, on January 11, he tweeted criticism of the "Section 702" act, which authorizes much of the electronic surveillance carried out by US spy agencies. Even without having seen the document, Rosenstein and FBI Director Christopher Wray personally lobbied Ryan to block its release on the grounds that it could disclose top-secret information on US counterintelligence operations. Last week, the department told Nunes in a letter that its release would be "an unprecedented action" and "extraordinarily reckless." Democrats say the memo, in focusing on the Steele dossier, consciously ignores a lot of other classified information that justified the surveillance warrant. John McLaughlin, a former deputy director of the Central Intelligence Agency, noted Monday on Twitter that normal FISA warrant requests are detailed 50-60 page documents. "If the Nunes memo about one is just 4 pages, you can bet it's a carefully picked bowl of cherries. Made all the more dishonest by holding back the minority rebuttal memo," he wrote.